In my land there are no distinctions. rutting in the fertile fields. full of nothing but contented childlike syllables. Everyone reads Russian short stories and weeps. I don’t even like political poems. Do you think I can believe in a war between races? (I know you don’t believe this. I’m marked by the color of my skin. The bullets are discrete and designed to kill slowly. They are aiming at my children. These bullets bury deeper than logic. I cannot reason these scars away. and the blessings of human understanding. the sounds of blasting and muffled outrage. My own days bring me slaps on the face. and this is my land. 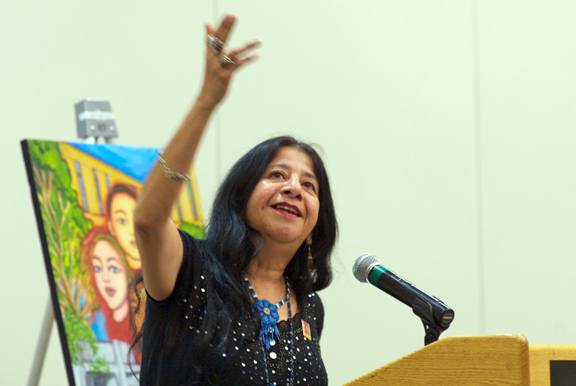 “Lorna Dee Cervantes evokes the cultural clash that Americans of Mexican descent frequently face.” Read more about her poetry at Poetry Foundation. ← Why Am I So Brown? I wish I had written such a poem. Muy cierto esto. A friend guided me here. Thank you, this is both beautiful and effective, and comforting, comforting to know others feel this way and are able to explain those feeling so eloquently.